This stunning ring is set in a middle with One Round Brilliant Cut Diamond 0.52 Carat of outstanding quality: Clarity VVS2, Color E, Good cut, certified by GIA. GIA cert for the center stone. The Ring is Pave set on the sides with 12 Round Brilliant Cut Diamonds, approx. Setting：Pave & Prong Setting. Match Pendant. Shape：Round Single Cut. Shape：Round. Ring Size：6.5 (resizable). Shape：Round Singe Cut. Need upgrade the ring to 9K.10K.14K.18K White/Yellow/Rose Gold or the accent diamonds upgrade to VS or VVS. Center Raise: 6mm. Diamond Shape: Round / Princess. When the manufacture makes errors, it can lead to a defect in the item stone setting. Our warranty covers manufacture defects such as loose stones or missing stones caused by the failure to tighten prongs when setting the diamonds. 1 round cut diamond. 52ct 5.17x3.17mm. 7.05mm wide front face of ring (across top to bottom). 2.12mm wide back shank (most narrow area of the band). Diamond Information. General Information. Resizing and Fees. 1 round diamond. 58ct 5.46x3.22mm. 2.12mm wide front face of ring (across top to bottom). 1.50mm wide back shank (most narrow area of the band). Diamond Information. Gram Weight. Total ct weight. Resizing and Fees. The ring is 18 Karat White Gold (stamped "18K"). The ring is set in a middle with One Round Brilliant Cut Diamond weighing 0.40 Carat, Clarity SI1, Color H, Good cut. The Ring is Pave set on the sides with 14 Round Brilliant Cut Diamonds, approx. Clarity I3. 1 round diamond. 52ct 5.22x3.21mm. 2.45mm wide front face of ring (across top to bottom). 1.45mm wide back shank (most narrow area of the band). Diamond Information. Resizing and Fees. Jewelry Type. 1 round diamond. 58ct 5.43x3.21mm. 2.26mm wide front face of ring (across top to bottom). 1.83mm wide back shank (most narrow area of the band). Diamond Information. Color Foggy. Resizing and Fees. Clarity I3. Setting：Pave & Prong Setting. Size：6.5mm to 8mm〔ideal is 7.5mm〕. ★Side Stones：100% Genuine Natural Diamonds. Shape：Round Full Cut. Shape：Round. Ring Size：6.5 (resizable). Width Bottom：1.8mm. Width Top：11.7mm. Diamond Ring: 14K white gold (stamped "14K”) Cast Diamond Ring, size 5.75, weighing 3.9 g or 2.5 dwt. Round Brilliant Cut Natural (origination) Diamond. These rings are part of a unique diamond bridal collection recently produced by our team. The ring marked: "14K; JABEL. It isH in color, VS2 in clarity and is very sparkly ! The total diamond weight in this ring is0.59 carat. The ring is crafted in14K yellow gold. The ring is fitted for a size 5.25 finger (sizable) and weighs5.7 grams. Stamped: 14K;. The diamond is VERY sparkly! 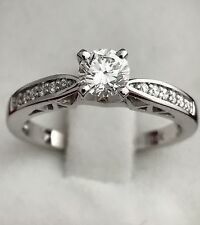 PRETTY ~ 14K White Gold ~ 0.62 Ct. The diamond in this ring has been fully graded by IGI / International Gemological Institute. The Diamond is set into a 14K White Gold 4 prong mounting that has the IGI cert number stamped inside the mounting and the 0.62 for the size stamped into it. Radiant with0.50 ct. total weight of diamonds, this ring is polished to a bright shine. Diamonds are set close together for a uniform and clean look. This ring showcases genuine white diamonds. The white diamonds line down the center of the shank inshared prong setting. 14K Yellow Gold Marquise Solitaire Diamond Split Shank Engagement Ring 1/2 CT.
Center setting consist of solitaire Marquise diamond. The split shank is finished with a row of genuine round diamonds. Radiant with 1/2 ct. t.w. (1/8 ct. Diamonds are secured in prong setting. Solid mounting, the ring weighs approx. ). Center round diamond. 34ct I1-2 H 4.28x2.79mm. 3.02mm wide front face of ring (across top to bottom). 4 round diamonds x. 05=.20ct SI2 H. 1.94mm wide back shank (most narrow area of the band). Diamond Information. These rings are part of a unique diamond bridal collection recently produced by our team. Diamond Ring: 14K rose/red gold (stamped "14K") SGS Cast & Assembled Diamond Ring, size 6.5, weighing 3.5 g or 2.3 dwt. Center Diamond Clarity Grade: VS2. Side Diamond Clarity Grade: VS2. Center Diamond Carat Weight: 0.50 Carat. Side Diamond Carat Weight: 0.04 Carat. GIA Report #6177316920. Center Diamond Cut Grade: Good. Accent diamonds weight appx : 0.16 Ct, 2.6 mm each. Center diamond weight appx : 0.35 Ct, 4.5 mm. Total diamond weight appx : 0.51. Clarity : I2-3 (visible inclusions). Diamonds are set in 14K White Gold. Diamond Shape: Round & Princess. Center Raise: 6.67 mm. When the manufacture makes errors, it can lead to a defect in the item stone setting. Our warranty covers manufacture defects such as loose stones or missing stones caused by the failure to tighten prongs when setting the diamonds. 10K Rose Gold Brown Diamond Wedding Engagement Ring Ladies Flower Halo 0.50 CT.
Center setting consist of round brown diamond to form a brilliant cluster flower setting. The ring is finished with a row of genuine round diamonds flank the side of the shank. Diamonds are secured in prong setting. ★Side Stones：100% Genuine Natural Diamonds & Genuine Sapphires. Setting：Pave,Channel,Prong Setting. Shape：Round Singe Cut & Round Cut. Shape：Round. Ring Size：6.5 (resizable). Need upgrade the ring to 9K.10K.14K.18K White/Yellow/Rose Gold or the accent diamonds upgrade to VS or VVS. 14kt White Gold - 3.4gm. Toll Free - 1.866.599.3929. MJW - 55005. Diamond Shape: Round, Princess & Baguette. Center Raise: 6.75mm. When the manufacture makes errors, it can lead to a defect in the item stone setting. Our warranty covers manufacture defects such as loose stones or missing stones caused by the failure to tighten prongs when setting the diamonds. 1 round red treated diamond. 52ct 5.04mm. 5.09mm wide front face of ring (across top to bottom). 2.04mm wide back shank (most narrow area of the band). Diamond Information. Photos have been enlarged to show detail. Center Raise: ----. Diamond Shape: Princess & Round. When the manufacture makes errors, it can lead to a defect in the item stone setting. Our warranty covers manufacture defects such as loose stones or missing stones caused by the failure to tighten prongs when setting the diamonds. 14K Yellow Gold Princess Cut Solitaire Diamond Halo Engagement Ring Band 1/2 CT.
Center setting consist of solitaire princess cut diamonds which is 1/4 ct. t.w. The ring is finished with a row of genuine round diamonds down the side of the shank. Radiant with 1/2 ct. t.w. (1/4 ct. ). 14K White Gold Diamond Solitaire Ring (1/2 CT). The Diamonds are Natural (No Color Enhancement). The minimum total diamond carat weight is 0.46 CT.
Diamonds 1 center round diamond . 41ct 4.79mm I1 H. 9.32mm wide front face of ring (across top to bottom). 2.39mm wide back shank (most narrow area of the band). Diamond Information. 15 single cut diamonds x. 015=.22ct VS1 H.